CANNIBAL CORPSE's comprehensive historical document "Centuries of Torment: The First 20 Years" is on hell of a tough act to follow in terms of DVDs. And that's exactly the reason you shouldn't compare "Global Evisceration" to it. As far as content and purpose is concerned, it is apples and oranges. 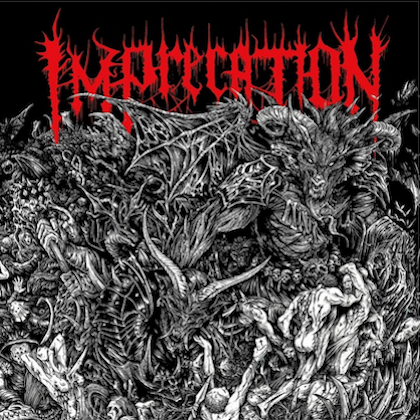 Instead, "Global Evisceration" works as an entertaining and informative look at CANNIBAL CORPSE on the international stage during its marathon, five-continent/40-country tour in support of 2009's "Evisceration Plague". "Global Evisceration" is an up-close and fun view into the lives of five death metal journeymen and their dedicated crew as they hit 10 of those 40 countries. Traveling largely by plane (and train in Russia), George "Corpsegrinder" Fisher, Alex Webster, Pat O'Brien, Rob Barrett, and Paul Mazurkiewicz show themselves to be so affable and often comical (Corpsegrinder takes the cake, as if that's any surprise) that you almost forget just how professionally they carry themselves. No matter the circumstances, this is a band that doesn't cancel shows, as was the case in Tel Aviv when they arrived without any luggage/equipment whatsoever and were forced to go on stage with borrowed equipment. They didn't miss a beat. The one constant of the globetrotting experience is sleep deprivation, which makes you appreciation the dedication to the fans demonstrated by the quintet and crew. It is also evident that the members of CANNIBAL CORPSE never take for granted their fortune in being able to travel the world and on this trip they hit several places for the first time in their careers, including Istanbul, Tel Aviv, and Malta. 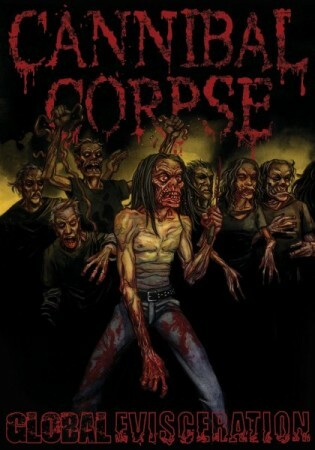 Interspersed throughout the tour documentary are performances of CANNIBAL CORPSE cuts filmed at Denver's Gothic Theatre and Albuquerque's Sunshine Theater. Both venues were picked specifically by the band because of a reputation for extreme audience participation. The choices were spot on, as evidenced from the intensity of reaction as the band tears through numerous tracks from its catalogue of solid gold smash hits, whether it was "Stripped, Raped, and Strangled", "Priests of Sodom", or the rarely played "Scattered Remains/Splattered Brains" from debut "Eaten Back to Life". The DVD comes with several extras as well, mainly different segments that expand upon the global touring theme, including fan testimonials, conversations with "metal brothers", and a clip called "The Gas Chamber" that shows the flatulent side of the storied act. "Global Evisceration" is another three hours of high quality CANNIBAL CORPSE live performances and touring insights. It was shot and edited by director Denise Korycki of "Centuries of Torment" fame, so you know beyond a shadow of a doubt that the presentation is first rate. You'll never meet a nicer, more professional, and more fan-dedicated bunch of guys than CANNIBAL CORPSE. Aside from the great tunes, that's why these DVDs always end up being much more enjoyable than the average release.